Alpine Panjab: Passage of the River Chunab. bl.uk > Online Gallery Home	> Online exhibitions	> Asia, Pacific and Africa Collections	> Alpine Panjab: Passage of the River Chunab. Plate 3 from "Recollections of India. Part 2. 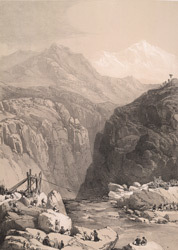 Kashmir and the Alpine Punjab" by James Duffield Harding (1797-1863) after Charles Stewart Hardinge (1822-1894), the eldest son of the first Viscount Hardinge, the Governor General. This depicts one of the five rivers of the Punjab, the Chenab which rises in the Himalayas and flows through northwest India and Pakistan. In ancient literature the river was known as Asikni, meaning black in colour in reference to its dark waters. The bridge pictured comprised a thick cable from which was suspended a seat drawn backwards and forwards by a rope. The snowy peak of the Pir Panjal is in the background.